A study done in 2013 revealed some amazing facts about how ignorant many Americans are regarding their credit scores and credit reports. For example, 2/5ths of those surveyed did not know that credit card companies and mortgage lenders use credit scores to determine their eligibility for credit. Another 2/5ths incorrectly believed that personal characteristics such as marital status and age are used to calculate credit scores. Between 25% and 33% did not know when it is that lenders must inform borrowers of the credit scores used in their lending decisions. More than 25% do not know how to raise or maintain their scores. And 36% incorrectly believed that credit repair agencies are usually or always helpful in improving credit scores and correcting errors in credit reports. If you don’t understand credit scoring and credit reports you could be facing big trouble. If you’re not aware of this, you definitely need a good credit score to qualify for an auto loan, a mortgage and other financing. And if you make just one misstep such as forgetting to pay a credit card bill, you could be on the slippery slope to serious credit problems. Do you know who compiles your credit reports? Your credit reports are compiled by the three major credit bureaus – Experian, Equifax and TransUnion. The information they use comes from banks and the financial institutions with which you do business and includes every credit contract you’ve ever had related to debt. Debt collectors even report to the credit bureaus. So if you have an old unpaid medical bill, this could pop up on your report and damage your credit score. In addition, the three credit bureaus collect information from public records on tax liens, court judgments and bankruptcies. Any time you apply for any type of credit (called a credit inquiry), this will be reported to the three credit bureaus. In turn, the credit bureaus provide your credit report to the lenders when you apply for new credit. Banks and credit card companies aren’t the only ones that access your credit reports either. Cell phone providers, landlords, insurers and utility companies will also ask for a credit report in determining whether or not they want to deal with you. According to the Fair Credit Reporting Act, employers can check your credit reports but they have to get your permission to do this. Of course, if you’ve applied for that dream job and your prospective employer has asked to check your credit reports, you’ll probably feel pressured to say yes. If you say no this would be as good as saying that you have poor or bad credit. And under no circumstances are employers or prospective employers permitted to check your credit score. There is an inverse ratio to credit scores. The higher your score the lower the interest rate you will be charged on an auto loan, a personal loan, credit card, and a mortgage. Even your auto insurance will cost less if you have a high score. Conversely, the lower the score, the higher your interest rates will be. You can get a free copy of your credit reports once a year. This is a perk that was legislated by Congress a few years ago. There is a website, www.annualcreditreport.com, where you can get all three of your credit reports either simultaneously or one at a time. Alternately, you can get your credit report free from each of the “big three” credit bureaus. You should get these reports and review them carefully to make sure they do not contain errors. If you do find an error in one of your reports you need to immediately dispute it with the appropriate credit bureau. What some people do is get their report from one of the credit bureaus every three months, which is a way to monitor their credit and immediately spot any fraud. Your credit reports will contain a lot of information but they won’t include your credit score. 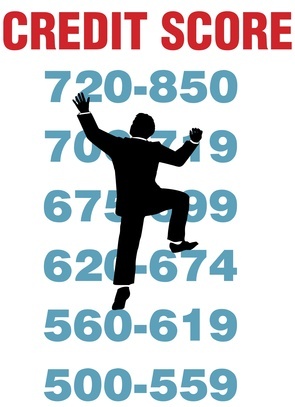 While there are a lot of different credit scores floating around the most important one is your FICO score as this is the score that most lenders use in determining whether or not to extend you credit. You can only get your FICO on the website www.myfico.com. Getting your credit score used to be a fairly big job. But it’s becoming much easier. You can get your score free on websites such as CreditKarma.com and CreditSesame.com and from the three credit reporting bureaus. These won’t be your true FICO score but should be close enough to give you a good idea of how you stack up. Whatever your number is, don’t fixate on it. The important thing is to understand how you stand in the range being used. FICO scores range from 300 to 850. This means that a score of 800 would put you in the range of very good or excellent credit. However, the VantageScore, which was developed by the three credit reporting bureaus, has a range of 501 to 990. It also assigns a letter grade to scores. If you were to have a VantageScore of 800 you would be ranked as C or Prime, which wouldn’t be as good as an 800 FICO score. If you have a Discover card you’re probably seeing your credit score every month on your statement. The credit card companies, 1st Bankcard and U.S. Bankcard have said that they will soon be sharing FICO credit scores and related information with their customers. This is in response to the US Consumer Financial Protection Bureau (CFPB), which has been urging the credit card companies to do this because it believes the more information a consumer has, the better a job he or she will do in managing their credit. While this has not yet proven to be true, it certainly can’t hurt for people to be able to see their credit scores every month and whether they’re getting better or worse. No, your age, marital status, number of children or any other personal information is not used in calculating your credit score. It is based on six factors: Your payment history, debts owed, length of credit history, amount of available credit, types of credit and your credit inquiries. If when you get your credit score you find that it’s either poor or bad there’s nothing you can do about your payment history. History is, after all, history. You also can’t do anything about your length of credit history. However, there is one factor you could get to work on – which is your debt-to-credit ratio. It’s calculated by dividing your debts owed by the amount of available credit you have. For example, if you have available credit in the amount of $10,000 and $5000 in debts owed, your debt-to-credit ratio would be 50%. Since this accounts for 30% of your FICO score this is an area where you could do something to affect it positively. The two alternatives are to either pay off some of your debts or ask one or more of your creditors to increase your credit limits. Do either one of these and you would lower your debt-to-credit ratio and this should have a positive effect on your credit score. If you’d like more tips for improving your credit score, watch this short video courtesy of National Debt Relief. What all this boils down to is that your credit score pretty much rules your credit life. And since your credit score is based on your credit reports – or how well you’ve used credit – the best policy is to always use it sensibly.